More than the statue, it was for a glimpse of the great man himself that most of the thousands of people had flocked to Parliament Square. A gospel choir and a short film on Mandela's life, narrated by Lord Attenborough, stirred the crowd in anticipation of the former South African president's arrival. As rumours spread of Mandela's arrival, it was suddenly the signal for loud applause as the 89-year-old, steadily got out of his car, helped by his wife Dame Graca Machel. It was the sort of welcome more suited to a pop star than an elder statesman but is a testament to Mandela's enduring appeal around the world. To many, Mandela is a superstar. "I wanted to be in the presence of greatness," said on-looker Jonas Johnson, 61, from Newham. Mayor Ken Livingstone said: "Long after we are forgotten, you will be remembered for having taught the world one amazing truth - that you can achieve justice without vengeance." Prime Minister Gordon Brown said Mandela would be forever remembered as the man who symbolised the end of Apartheid in South Africa. "He is the most inspiring and greatest leader of our generation. "From this day forward, this statue will stand here, in sight of this ancient forum of democracy to commemorate and celebrate for the ages triumph in the greatest of causes. "This statue is a beacon of hope." 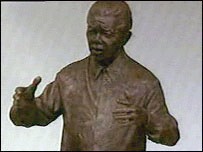 The cloth was then pulled back to reveal the bronze figure of Mandela wearing his trademark floral shirt and gesturing as though addressing a crowd. "The statue captures both his humility and his nobility," said Irene Erntzen, 58, from Essex. 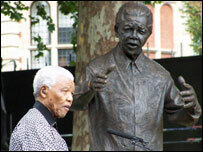 The nine-foot statue, designed by the late Ian Walters, stands closer to the ground than any of the other residents of Parliament Square, symbolising Mandela's status as a man of the people. Addressing the crowd in the Square where the statue of another South African, General Jan Smuts, stands, Mandela recalled a visit to London 45 years ago with fellow activist Oliver Tambo. "We half-joked that we hoped one day a statue of a black person would be erected here alongside that of General Smuts," he said. "Though this statue is of one man, it should in actual fact symbolise all those who have resisted oppression, especially in my country. "The history of the struggle in South Africa is rich with the story of heroes and heroines; some of them leaders, some of them followers: all of them deserve to be remembered." 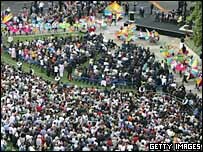 With the crowd eager for more he promised to return to London next year to celebrate his 90th birthday with a concert in support of his efforts to combat HIV/Aids.